Heavy rain, wind, floods, and power outages – yikes! Fall is taking over the Lower Mainland with a vengeance. Local meteorologists gave us the heads-up for weather mayhem this weekend, and they nailed it. The day has been fraught with on-again, off-again heavy rain jags and some terrific gusts of wind. It’s been dark, damp, dreary and cold. But hey – there’s a bright spot to be found in each day. Sometimes you have to look hard for it, sometimes you have to make it happen yourself, and sometimes it just lands at your feet. And so, despite the bleak weather, my day ended up being a delightful (and cosy) one! You see, my sister rolled into town for a short, barely-a-day-long visit. En route from Hawaii to Ottawa (where she lives), Sue had a 9-hour stop-over in Vancouver. I hopped in the car early this morning, drove to the airport and brought her back to my little pad in Langley. I don’t get to see her often, so this was a real treat. We gabbed. And we gabbed. And then we ate soup. 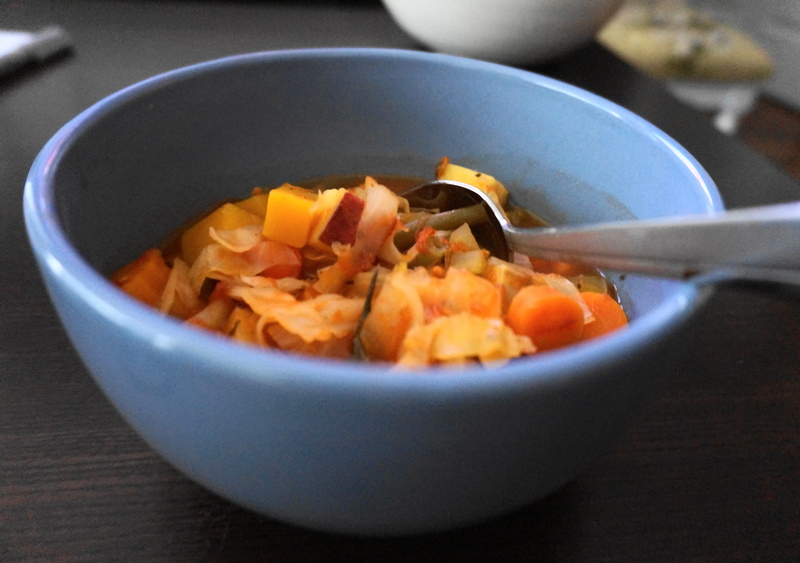 There’s nothing like a big pot of homemade vegetable soup – thick, hearty, stick-to-your ribs grub. And even better when made the day before. Into my favourite big Le Creuset dutch oven, I heated about a tablespoon and a half of coconut oil. I added a chopped onion, 3 chopped celery stalks, 3 chopped carrots, and after a few minutes, 3 minced garlic cloves. 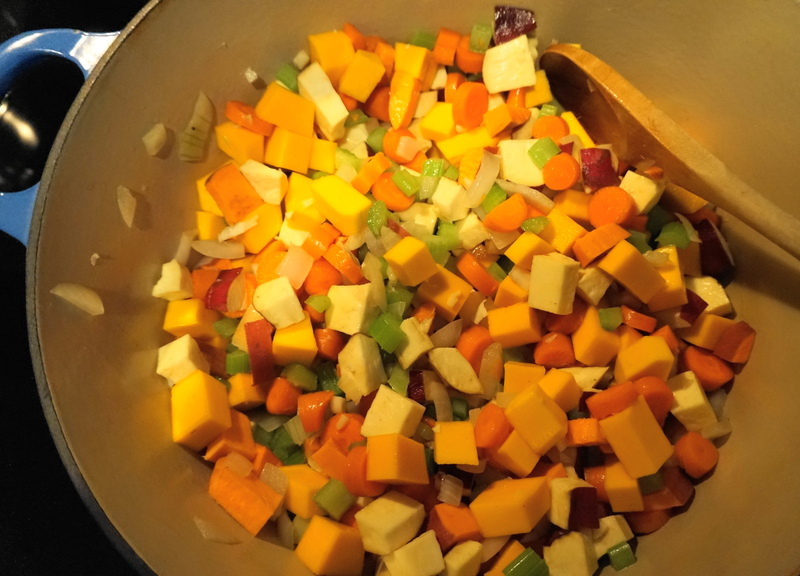 After another couple of minutes, I added 2 large chopped sweet potatoes, 1 chopped butternut squash. About a cup and a half of chopped green beans entered the pot. I added 1 28-ounce can of San Marzano tomatoes (including juice). I also added about 4 cups of vegetable stock. 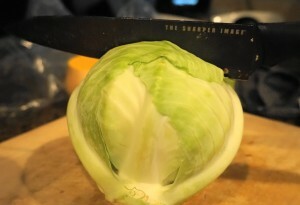 Then, I thinly sliced a small green cabbage and tossed the mound into the pot. Italian seasoning, Cajun spice, sea salt and lots of cracked pepper finished off the soup. Once it came to a boil, I let it simmer for about 45 minutes. Et voila! You can change up the vegetables. Then add lentils or chickpeas or black beans, or throw in shredded chicken for some protein. On this crazy-weather day, my sister and I wrapped ourselves in blankets, chatted to our hearts’ content, and ate soul-stirring bowls of steaming soup.